Given the abject tragedy wrought by shoddy, corrupt school construction practices during the 2008 Sichuan earthquake, one would think filmmakers would tread carefully when using such subject matter, especially for comedic purposes. Yet rather bizarrely, Dash Shaw essentially gets away with it, simply due to the slight, inconsequential nature of his film. 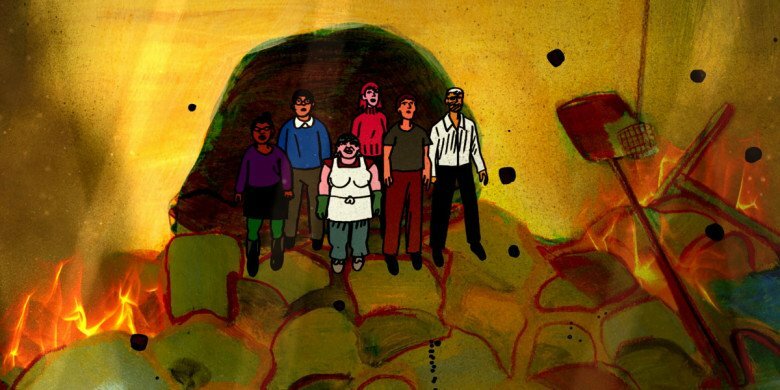 The titular secondary school is toast, but nobody really cares in Shaw’s My Entire High School Sinking into the Sea, which screens during the 54th New York Film Festival. Dash, Shaw’s hip, self-referential protagonist is convinced sophomore year will be better. However, the snide windbag is a just misery machine. For no good reason, he is about to alienate his only friend Assaf (a fellow school paper staffer) with a libelous erectile dysfunction story he slips past Verti, their equally jaundiced editor. Yes, these are cartoon characters, but it is hard to believe anyone could be such abrasive pond scum. Ironically, while Dash is on the outs with the paper, he stumbles onto the scoop of his career. Apparently, the principle knowingly constructed the new auditorium over unstable ground, which could indeed result in the entire high getting swept out to sea. Of course, it won’t be a scoop for long. At least Dash will sort of patch things up with Assaf and Verti when things go all Irwin Allen. Teaming up Mary, Dash’s detention mate with student council ambitions, they will try to survive the crisis. It sounds like My Entire Etc, Etc should be a ton of morbidly subversive fun, but Shaw goes for long stretches forgetting to add any jokes, just letting his characters amble about like they are in some mumblecore time-waster. Stylistically, he takes a page out of the squiggly-lined book of Dr. Katz, Professional Therapist, but it wears better over thirty (frequently quite droll) minutes than during the course of a somewhat slack seventy-five-minute feature. It turns out Thomas Jay Ryan can even class up this joint. His voice-over work as the remorseful Principal Grimm is definitely the film’s best. In contrast, most of the rest of the voice cast is a who’s who of annoying, droning-voiced hipsters who have an army of publicists constantly telling us how popular they are, but you would never invite them to your dinner party in a million years. Lena Dunham! Jason Schwartzman! Reggie Watts! Alex Karpovsky! Kill me now! Arguably, the events in question are pretty apt, considering everyone involved in the film is just too cool for school. If Shaw wants to stage a high-body-count school tragedy for laughs, that’s’ fine. He just needs to bring more humor next time. Wafer-thin and weirdly self-satisfied, My etc, etc might play okay as an original for some online streaming service, but it doesn’t cut it as a theatrical feature. 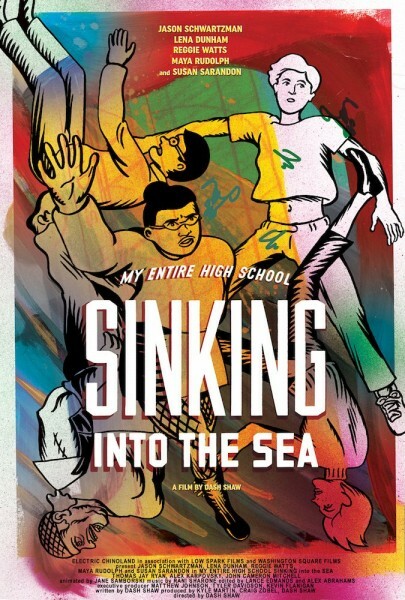 A real disappointment, My Entire High School Sinking into the Sea screens Monday (10/10) and Tuesday (10/11) during this year’s NYFF.